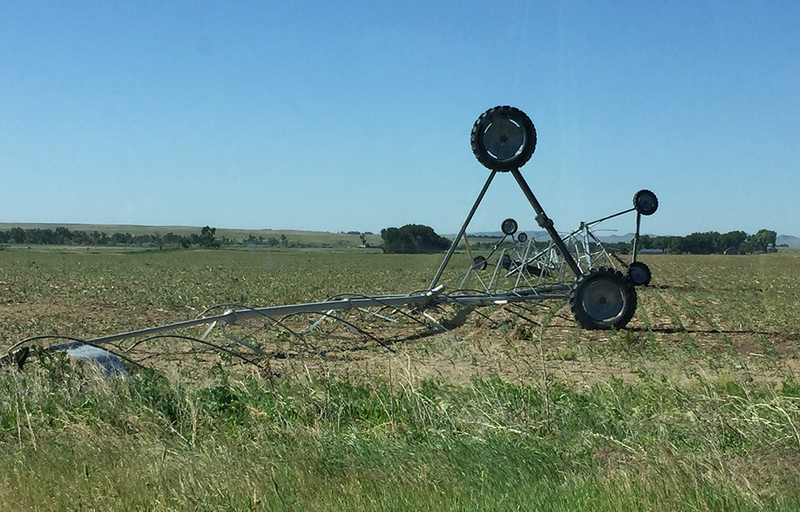 Storms swept through western, south central, and southeast Nebraska this week, bringing high winds, hail, flash floods and heavy rains, causing damage to fields and farm structures. Learn how degree-days are calculated and used to predict insect development and specifically, what they indicate for the timing of western bean cutworm development in Nebraska this year. Figure 1. A corn field in south central Nebraska without preemergence herbicide application. Applying a well-timed postemergence herbicide will be the only control option. (Photos by Amit Jhala). When applying postemergence herbicides, consider corn growth stage, weed species present, and crop and weed heights. The article includes how to determine corn growth stage, recommendations to avoid problems, and a table of application restrictions for common postemergence herbicides. Bacterial leaf streak disease has been confirmed on a sample submitted to the UNL Plant and Pest Diagnostic Clinic from Adams County. The corn was at the V4 growth stage and represents the earliest that the disease has been confirmed in a field. Ag professionals across central and eastern Nebraska are reporting insect damage to corn following rye and wheat cover crops, likely from the wheat stem maggot. A recent field survey found stand losses in fields ranged from 2%-30% on a whole-field basis. Figure 1. Soybean field infested with volunteer corn in southcentral Nebraska. Controlling glyphosate-resistant volunteer corn is a major challenge in some soybean fields this year as preemergence herbicides aren't very effective. Postemergence herbicides will be critical to its management. Check out these resources from Nebraska Extension and CropWatch on assessing hail damage to crops. View a seven-day time lapse video of how corn hailed at the V4 growth stage recovers. How Much Irrigation is Needed on Corn in the Vegetative Growth Stage? Strategies to time crop irrigation for maximum effectiveness suggest delaying irrigation until the critical reproductive growth stages will most benefit yield. This will also help reduce the potential for nitrate leaching. UNL Extension Entomology is monitoring crop insect pests (primarily moths) using black light traps at the Haskell Ag Laboratory near Concord, the South Central Ag Laboratory near Clay Center, and the West Central Research and Extension Center near North Platte. Extension crop reports and photos for the week, including storm damage photos. Cornhusker Economics: How Accurate are Crop Forecasts?